This recipe is inspired by the version on Heidi Swanson’s blog www.101cookbooks.com. It is fresh and light, and perfect for a light summer meal or a picnic. Who doesn’t love picnics. 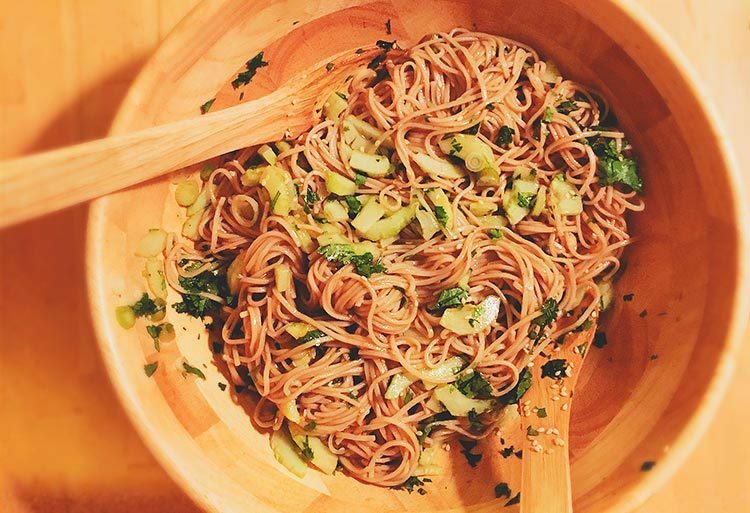 Soba noodles are also incredibly healthy. They have less calories, more protein, and more fiber than regular pasta, and they are also gluten-free. In the version photographed I forgot the shrimp *sigh*. Make the dressing by combining the zest, ginger, honey, cayenne, and salt in a blender. Add the lemon juice, rice vinegar and shoyu, and pulse to combine. With the blender running, drizzle in the oils. Set aside. Cook the shrimp in boiling water (don't overdo it- frozen shrimp don't need to be cooked until they taste like rubber bands). Peel & clean and set aside. Cook the soba in plenty of boiling salted water until just tender (usually 4 minutes), drain and rinse under cold water. Be sure it is really not warm and no longer cooking ! 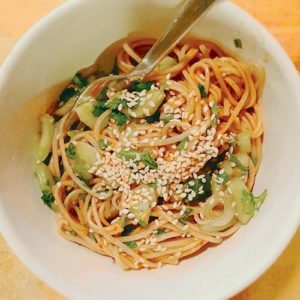 In a large bowl, combine the soba noodles, the cilantro, the spring onions, the shrimp, the cucumber, half of the sesame seeds, and 2/3 cup of the dressing. Toss until well combined, Taste, and add salt and pepper if needed. Serve topped with chopped cilantro and more sesame seeds.